This icon depicts the Holy Apostles appointed by Christ to sit and judge the twelve tribes of Israel in the Kingdom of God. They were with Christ during His ministry on earth and were eyewitnesses of many of the miracles that the Lord Jesus Christ wrought and teachings that He brought for our salvation. St. Peter and St. Paul are shown holding the Church in their hands. Often in depictions of these Holy Apostles, St. Paul is added to those mentioned in St. Matthew 10:2-4, even though he became an Apostle later when Christ appeared to him on the road to Damascus. 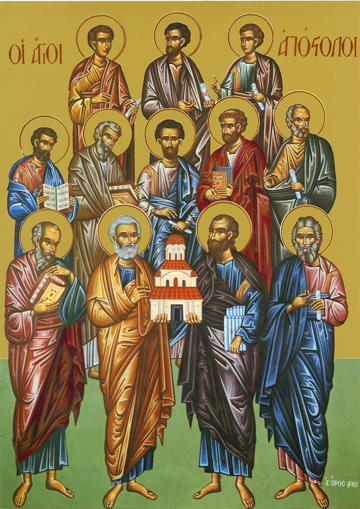 These Twelve Holy Apostles are St. Simeon Peter and his brother Andrew, the First-Called, St. James and St. John the Theologian, the sons of Zebedee, St. James and St. Matthew, the sons of Alphaeus, St. Philip, St. Bartholomew (also called Nathaniel), St. Thomas, St. Jude Thaddaeus, the Brother of the Lord, St. Simon the Zealot, and, after Judas Iscariot became a traitor, St. Matthias who was chosen by lot to fill his place through prayer. May we all look with hope at these twelve seemingly ordinary men whose obedience and love of God changed the world.